Arsenal "need" Arsene Wenger and the Gunners boss should be able to choose when he leaves, says the club's second largest shareholder Alisher Usmanov. Wenger should also be involved in "planning the succession process". "The club must retain its major symbol and main asset - manager Arsene Wenger," said the Russian businessman. But despite the public backing, Usmanov added that Arsenal had been "haunted" by failure for many years and "cannot win" this season's Premier League. Arsenal have been knocked out of the Champions League at the last-16 stage for the sixth season in a row and lost to Watford in the FA Cup quarter-finals. They are third in the Premier League, 11 points behind leaders Leicester and have not won the title since 2004. Wenger, who has been at the club since 1996, has had his position questioned and his team's performances criticised in recent weeks. Usmanov, who has increased his stake in Arsenal above 30% said: "I believe that Arsene Wenger is a great coach and Arsenal have to give him the opportunity to plan the succession process and leave his legacy when he deems it necessary. Arsenal need Arsene Wenger." Speaking to Rossiya24 TV channel he added: "Failures have been haunting Arsenal for many years now, they cannot become the EPL champions. This has led to some discontent with Wenger's position as a manager. " Is Wenger nearing the end at Arsenal? 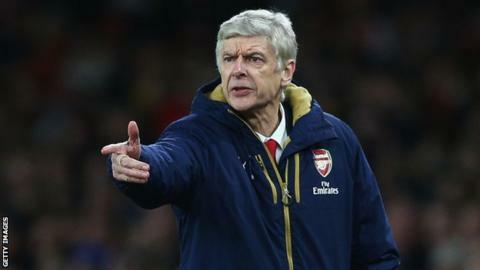 Read more on Is Arsene Wenger nearing the end at Arsenal?